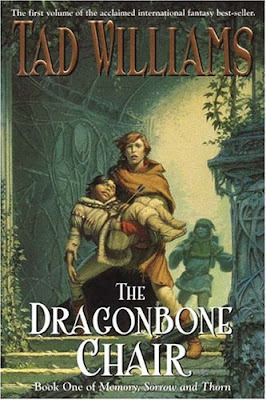 Tad Williams is a highly acclaimed Fantasy novelist and this series: Memory, Sorrow and Thorn is considered one of the must-reads of the fantasy genre. Book One, The Dragonbone Chair, sets the stage and introduces our hero, Simon (and other key players as well). This book is part coming-of-age-story, part classic-good-verses-evil-drama, part political intrigue, with just a hint of first love. I found here, a good mix of round and flat characters. I was very interested in the events of the story. I liked it. I feel compelled to read the rest of the series to find out what happens. All that being said, I went in to this book hoping to be captivated and swept away. I was not. 700+ pages should have flown by in a week's time. It took me nearly 2 months to finish it. I'm not sure why, but it just didn't grab me. Even though I liked it, I didn't find myself wondering what would happen next whenever I had to put it down. Even though I liked it, I didn't feel any sense of urgency to get back to it as soon as I possibly could. I'd recommend this one if you already love fantasy, but probably not if you're just getting acquainted with it. I wish I could give it 4 stars, but I have to go with 3. I'm also curious as to what you (or anyone else) would recommend in the fantasy genre to those just getting acquainted? Hi-- Tad William's Shadowmarch really surprised me-- deliciously epic with multi-storylines. You might give it a look. There are more subgenres too.